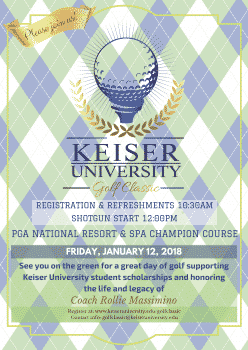 Keiser University is excited to announce the 2018 KU Golf Classic, taking place on January 12, 2018 on the renowned Champion Course at the PGA National Resort & Spa. This year it is our distinct honor to highlight a true legend, Coach Rollie Massimino. We have sponsorships, foursomes, and individual golfer opportunities available with the proceeds from this year’s tournament being awarded as student scholarships through the Rollie Massimino Scholarship Fund. Visit our website, for all the details. We look forward to seeing you there!